Finally all settled into my new apartment, I couldn’t wait to get in the kitchen and back to my normal routine of cooking up a storm. With the weather finally taking a turn for the chilly, it’s time to start baking. Although I love a fresh batch of cookies in the summer, it’s almost impossible to get me to pre-heat the oven (read: pre-heat my entire Brooklyn apartment) for some goodies. But with autumn in full swing, bring on the baked goods. 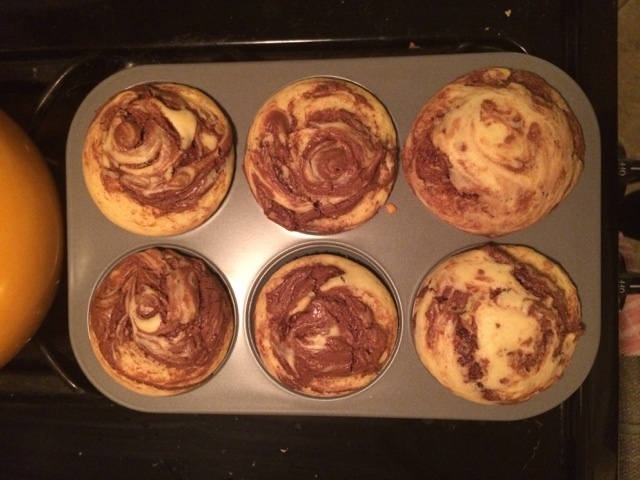 To start things off this year I went with these Swirled Nutella Muffins, inspired by this recipe from Ready, Set, Plan. To start, pre-heat the oven to 325 and set aside two bowls (one for dry mix and one for the wet mix). This recipe will make a dozen small muffins OR 6 overflowing, huge muffins (like I made). Depends on how many people you’d like to share with. Combine the butter, oil, sugar, eggs and vanilla into the wet mixture bowl and beat together until smooth. 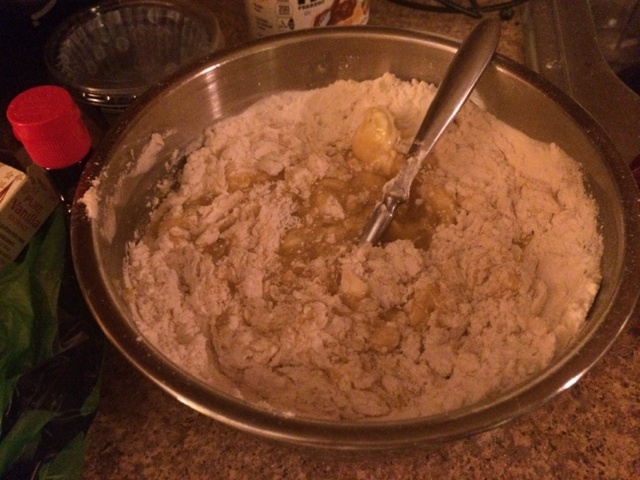 Next, combine the flour, baking powder and salt into the dry bowl and mix until even. 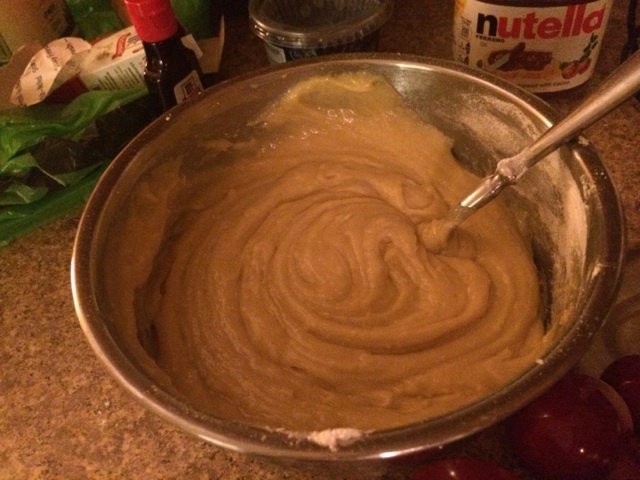 Pour the dry ingredients into the wet mixture bowl and beat together until you have a smooth batter. 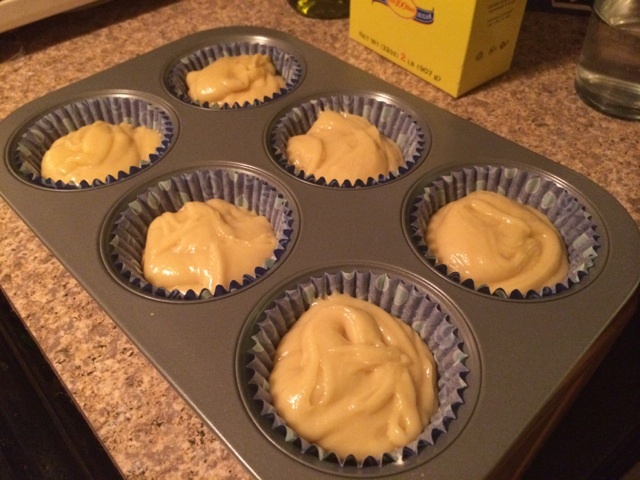 Once smooth, spoon the mixture into a muffin tin (I used baking cups for less mess). 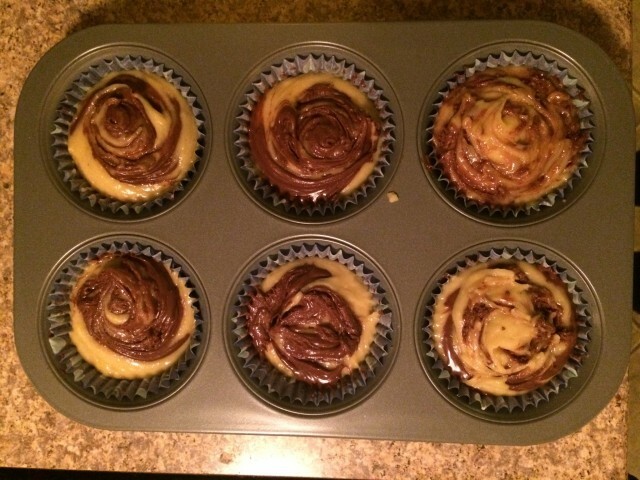 These will rise, so leave some room at the top to add Nutella before baking. Filling each cup about halfway with batter should do. I added a bit more to make them large & in charge. Now the fun part. 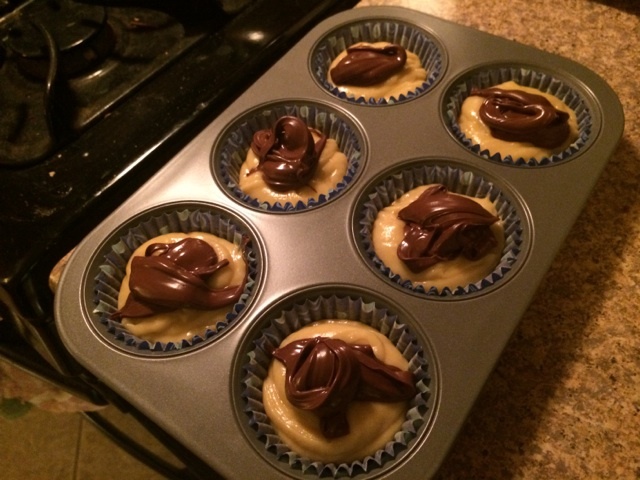 Take spoon sized globs of Nutella, as much or as little as you’d like, and plop on top of the batter. To swirl, use the end of a chopstick, baking stick or something sturdy and slim to spin the mixture around. But just enough to get a nice design and make sure it’s mixed into the center of the muffin. 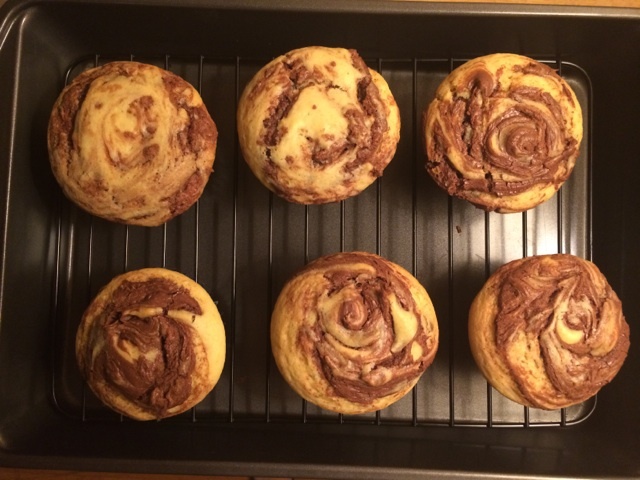 I found it much easier to swirl from the batter to the Nutella, rather than vice versa. Once to your swirled desire, toss these in the oven for 25 minutes. Depending on your oven, check how they are doing around 20 minutes and see if they need a little extra time. But for me, 25 was an almost perfect stopping time for baking. Voila! After pulling out of the oven, stick a toothpick in each to check that they are cooked all the way through. When you pull it out, it should come out clean with no batter stuck to the stick. While swirling and getting a nice design on top is fun. You might want to alternate pouring a small amount of batter, then some Nutella, then some batter, then some Nutella and finishing with a batter top — as another way to cook these. 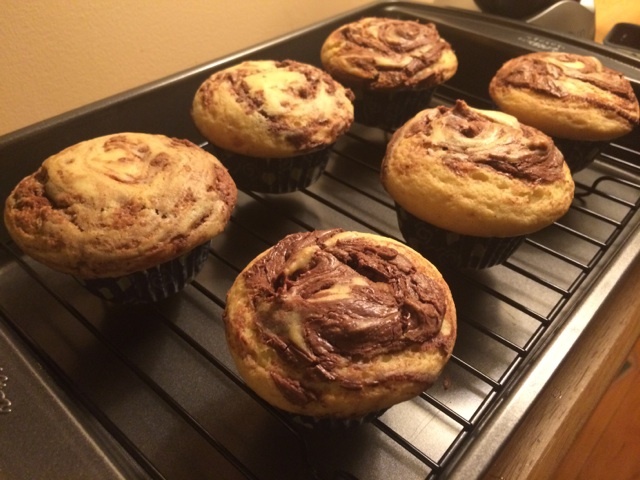 The batter should enclose the muffin and keep all the melted Nutella delicious inside. Tags: baking, Batter, Nutella, Oven, recipes, ROOKIE CHEF, Sugar. Bookmark the permalink. These look seriously tasty. NOM NOM NOM!